6. Benkelfat, C., Ellenbogen, M. A., Dean, P., Palmour, R. M., & Young, S. N. (1994). Mood-lowering effect of tryptophan depletion. Enhanced susceptibility in young men at genetic risk for major affective disorders. Archives of General Psychiatry, 51(9), 687–697. 8. Bielenberg, J. (1991). [Folic acid and vitamin deficiency caused by oral contraceptives]. Medizinische Monatsschrift Fur Pharmazeuten, 14(8), 244–247. 18. Galland, L. (2005). Patient-centered care: Antecedents, triggers, and mediators. In Textbook of functional medicine (pp 78-92). Institute for Functional Medicine. 21. Higdon, Jane. “Vitamin B6.” Linus Pauling Institute. Retrieved from lpi.oregonstate.edu/mic/vitamins/vitamin-B6. 22. Holman, R. T., Adams, C. E., Nelson, R. A., Grater, S. J., Jaskiewicz, J. A., Johnson, S. B., & Erdman, J. W. (1995). Patients with anorexia nervosa demonstrate deficiencies of selected essential fatty acids, compensatory changes in nonessential fatty acids and decreased fluidity of plasma lipids. The Journal of Nutrition, 125(4), 901–907. 28. McNally, L., Bhagwagar, Z., & Hannestad, J. (2008). Inflammation, glutamate, and glia in depression: a literature review. CNS Spectrums, 13(6), 501–510. 31. Miller, H. L., Delgado, P. L., Salomon, R. M., Berman, R., Krystal, J. H., Heninger, G. R., & Charney, D. S. (1996). Clinical and biochemical effects of catecholamine depletion on antidepressant-induced remission of depression. Archives of General Psychiatry, 53(2), 117–128. 34. Oxenkrug, G. (2013). 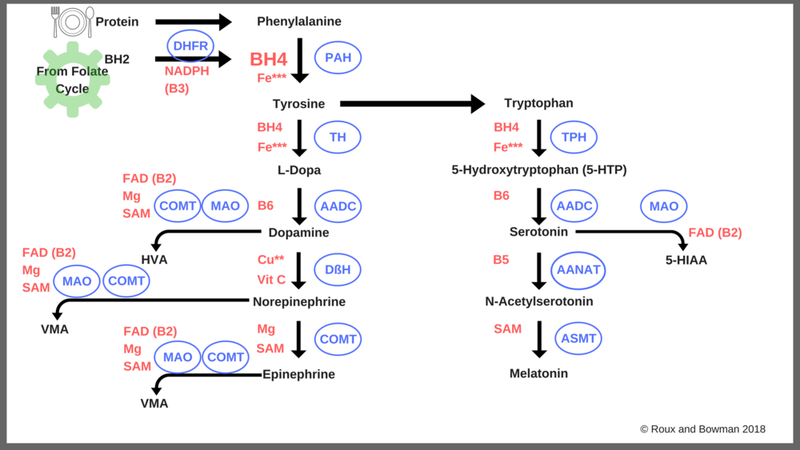 Serotonin – kynurenine hypothesis of depression: historical overview and recent developments. Current Drug Targets, 14(5), 514–521. 49. Weatherby, D., Ferguson, S., (2002) Blood chemistry and CBC analysis- Clinical laboratory testing form a functional perspective. Jacksonville, OR. Bear Mountain Publishing.